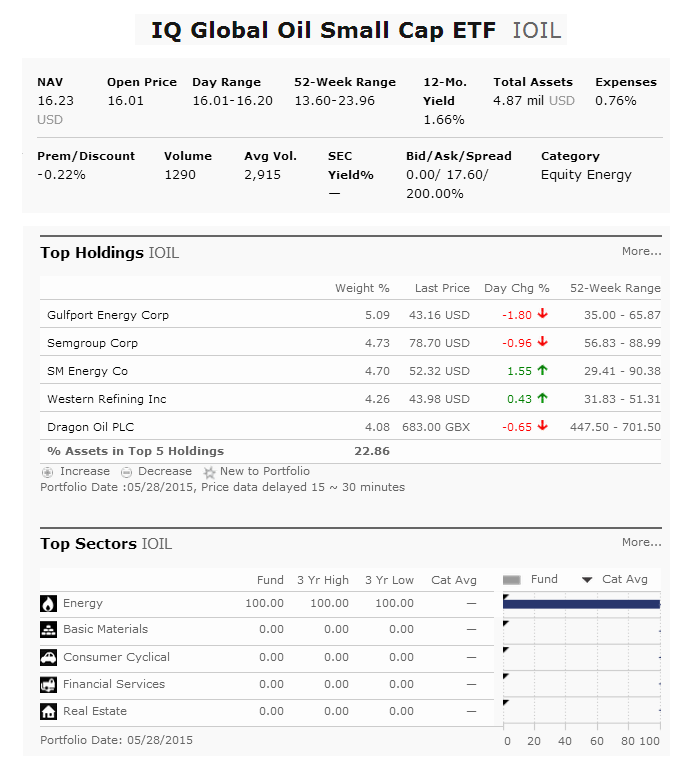 IQ Global Oil Small Cap ETF (IOIL) is an equity energy exchange traded fund. This ETF invests in stocks of oil sector companies. It uses its assets to purchase global small cap companies engaged in the oil sector, including in the areas of exploration and production, refining and marketing, and equipment, services and drilling. This equity fund is tracking the IQ Global Oil Small Cap Index. This index fund has $5.24 million of assets. Its dividend yield is 1.66%. The annual expense ratio fee is 0.76%. The current share price is $16.20. 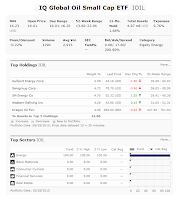 As of June 2015, the top 5 stocks are Gulfport Energy Corp, Semgroup Corp, SM Energy Co, Western Refining Inc, and Dragon Oil PLC. Top sector is energy. It has a yield for income. Hence this is an ETF, there is no sales load. It is a sector ETF, it may be volatile.